Vanadium One Energy Corp. (TSXV:VONE), is pleased to release assay results from the first 8 holes of its 2018 fall drilling program at its 100% owned Mont Sorcier Project, near Chibougamau, Quebec. Vanadium One Energy Corp. (TSXV:VONE), is pleased to release assay results from the first 8 holes of its 2018 fall drilling program at its 100% owned Mont Sorcier Project, near Chibougamau, Quebec. 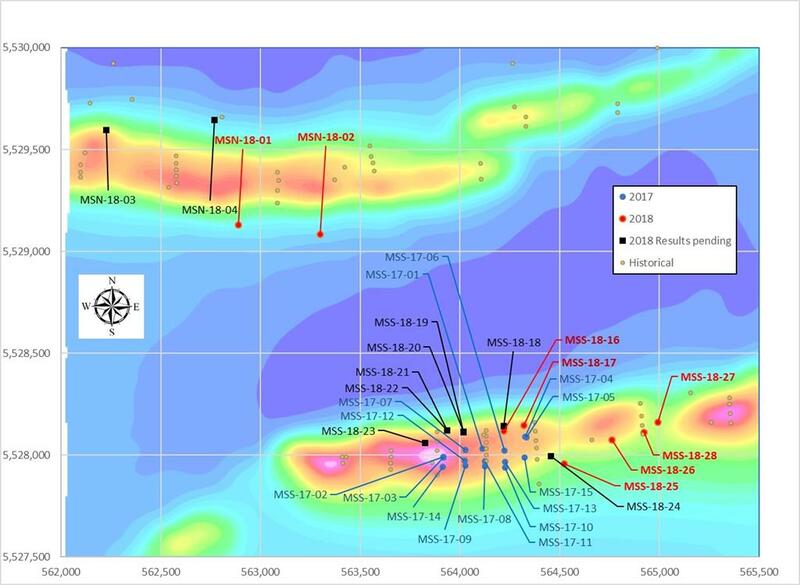 Drilling intersected significant continuous mineralization throughout each hole, with Hole MSN-18-02, one of the first four holes to be drilled in the North Zone, returning a continuous wide mineralized intersection of 244 meters grading 60.5% Fe and 0.63% Vanadium Pentoxide (V2O5), using the Davis Tube Test (DTT). Furthermore the average content of Vanadium Pentoxide (V2O5) in magnetite concentrate is 0.53% with an average Iron (Fe) content of 62.3% across 1,037 meters of drill core samples, as shown in Table 1. The vanadium pentoxide grade profile of these intersections compares favorably with historical grades published by Campbell Chibougamau Mines Ltd. in 1974, and also with results from the Company’s drill results published in 2017. The Company drilled a total of 17 new holes between September and December, 2018, adding 13 holes in the South Zone and completing 4 holes in the North Zone. Drilling continued eastward in the South Zone at either 100 or 200 meter line spacings (MSS-18-26 to MSS-18-28). Drilling concluded with 4 new drill holes located in the North Zone (MSN-18-01 to MSN-18-04), along strike and on approximately 500 meter line spacing. Drill hole locations are found in Figure 1. A total of 1,171 core samples were delivered to SGS in Val d’Or, from November through December, 2018, and SGS began delivering assay results late December, 2018. Each sample is assayed twice using XRF technology. Rock (Head) samples are initially crushed and assayed. Each sample then undergoes laboratory scale Davis Tube Testing (DTT) which produces a magnetite concentrate by removing non-magnetic material. The upgraded magnetite concentrate is then re-assayed for its Iron and Vanadium content and the Company reports these assay grades. The Mont Sorcier Project is a bulk tonnage magnetite iron ore and vanadium deposit, with very low titanium content, located near the northern Quebec mining town of Chibougamau. The project is comprised of 37 key mineral claims covering approximately 1,910 Ha (4,797.4 acres), with an historical resource of 273 million tons as published in 1974 by Campbell Chibougamau Mines Ltd. The technical information contained in this news release has been reviewed and approved by Pierre-Jean Lafleur, P.Eng. (OIQ), who is a Qualified Person with respect to the Company’s Mont Sorcier Project as defined under National Instrument 43-101. Vanadium One Energy Corp. is a mineral exploration company headquartered in Toronto, Canada. The Company is focused on advancing the Mont Sorcier Magnetite Iron Ore and Vanadium Project, in Chibougamau, Quebec. The goal is to define the extent of this resource and demonstrate its economic viability. Click here to connect with Vanadium One Energy Corp. (TSXV:VONE) for an Investor Presentation.